North Korea apparently succeeded in placing a satellite in Earth orbit after a Wednesday morning (Dec. 12) launch that is already drawing condemnation from the United States and other Western nations. North Korea launched its long-range Unha-3 rocket at 9:49 a.m. Wednesday local time (7:49 p.m. EST on Tuesday) from Sohae Satellite Launch Station on the nation's northwest coast. North Korean officials declared the launch a success shortly thereafter, claiming that the Unha-3 had delivered a scientific satellite to orbit as planned. The rogue nation has a history of making such claims even after failed liftoffs, but it appears to be telling the truth this time. "Initial indications are that the missile deployed an object that appeared to achieve orbit," the North American Aerospace Defense Command, a joint U.S.-Canadian effort, said in a statement. "At no time was the missile or the resultant debris a threat to North America." If it was indeed successful, the launch would end a string of rocket mishaps for North Korea. A satellite launch this past April failed shortly after liftoff, and similar attempts in 1998 and 2009 also flopped. These past blastoffs drew condemnation from the United States, South Korea and other nations, which viewed them as thinly disguised missile tests. North Korea is an unpredictable, nuclear-armed regime, and the West is concerned about any advances the country may make in its weapon-delivery capabilities. Wednesday's launch has already elicited a strong reaction. The White House called it a "highly provocative act that threatens regional security," and United Nations Secretary-General Ban Ki-moon declared it a "clear violation" of a UN resolution, the BBC reported. 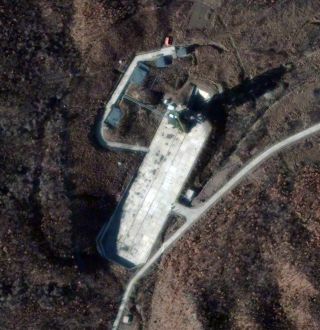 While North Korea had announced its intention to launch the Unha-3 soon, Wednesday's liftoff comes as a bit of a surprise. On Monday (Dec. 10), officials extended the launch window until Dec. 29, saying that engineers were working through a technical issue with the rocket.